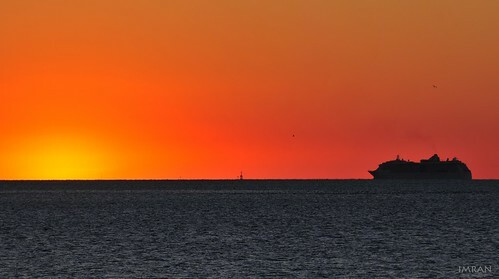 Sailing Off Into The Sunset – IMRAN™, a photo by ImranAnwar on Flickr. As I stood at my dock, waiting to see what new magical colors the sky would display at sunset, I noticed a cruise ship heading out of Tampa Bay, towards the Gulf of Mexico. As the sun set on a lovely, but not overly spectacular sunset sky, I knew the ship would not make it there in time to give me a great silhouette shot. But, just at the moment the direct sight of the sun took its last gasp and slid under the horizon, the ship was in the frame just enough to make for a lovely effect nonetheless. I clicked Bon Voyage to the ship, as it’s passengers enjoyed Sailing Off Into The Sunset, literally. (Straight Out Of Camera image, with no color editing, but cropped lower 500 pixel rows of water to give a widescreen view).